The FEI is a movement co-created by peasants, farmers, gardeners, scientists, students, activists, NGOs and agroecological companies – working together towards a sustainable, healthy, viable food system that is fair and just for the earth, the consumer and the producer. This edition marks the 6th edition of the FEI at the Wageningen University and we are very pleased to see the FEI movement growing with every edition. Students of Wageningen University can expand the FEI and turn it into a Capita Selecta course with The Rurual Sociology Group. The group offers this option because it acknowledges the added value for students to be part of the FEI. As students, destined for a future career as researcher, policy maker, entrepreneur or farmer will benefit from a more qualified professional education if they understand and experience the daily reality of a farm. During the mornings of this years’ Farm Experience Week the participants took part in interactive workshops guided by experts from the field and from research; WUR, Louis Bolk Institute, Biovitalis, Van Akker Naar Bos, Cultivate! and Boeren in het Bos. In the afternoons the group went on excursions to farms, gardens and fields, allowing the participants to bring their knowledge to the field and to learn more about ‘agroecology in practice’. 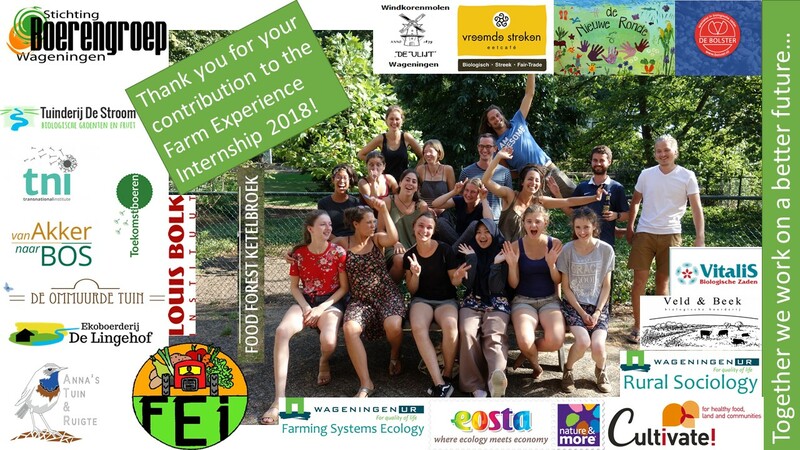 The following places were part of this years program; Nieuwe Ronde, Ommuurde Tuin, Ketelbroek foodforest, Veld en Beek, Anna’s Tuin en ruigte and a research plot of Stichting Heideboerderijen. Besides co-organising the program of the FEI, the FEI receives financial sponsorship and sponsorship in kind from many of the co-creators. Sponsorship in kind ranges from offering a free tour at a farm, or giving a guest lecture for free to contributing by giving products such as vegetables or seeds. This character of jointly wearing makes it possible to keep the participation fee low and thereby accessible for every student. While working towards better food systems, the joy of sharing a nice meal in the middle of the day can not be left out. This year the local caterer ‘Vreemde Streken’ turned the sponsored food products every day into another delicious meal showing what is possible with local products and limited budget.